Mike and I have been mad about football, for as long as I can remember. I could actually pinpoint a time when things got ‘real’ to the day when we had a sibling fight over a Match Magazine Mike had bought back in 1988! 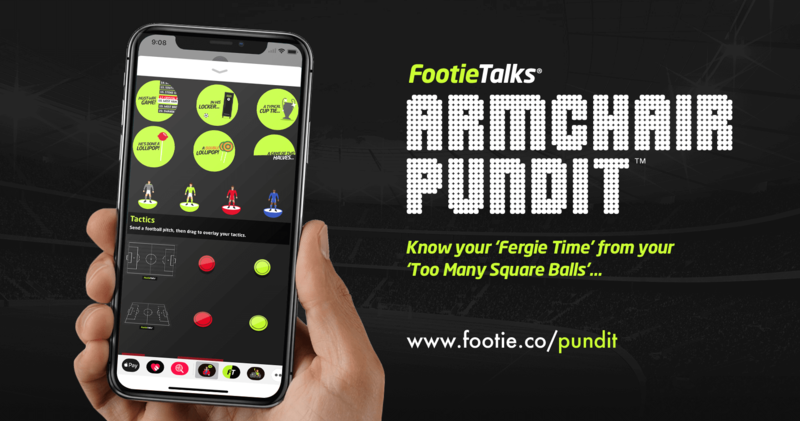 We were a little bit excited about the Armchair Pundit iMessage sticker App as we wholeheartedly appreciate the work that goes in to football punditry. More often than not, I will receive a text message from Mike while Match of Day is on with a simple one-liner – “Great Hit” – referring to Alan Shearer’s accurate assessment of a game. We sometimes even send the same message simultaneously which not only adds to the humour of the nights viewing but is great sibling banter. This provided us with great inspiration for this iMessage sticker App, which can be downloaded here. 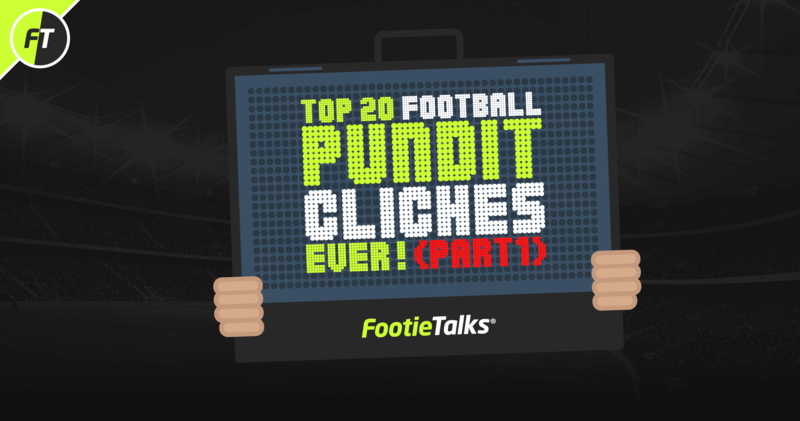 To coincide with this release we have compiled our Top 20 pundit sayings and a bit of the story behind them… we hope you enjoy! 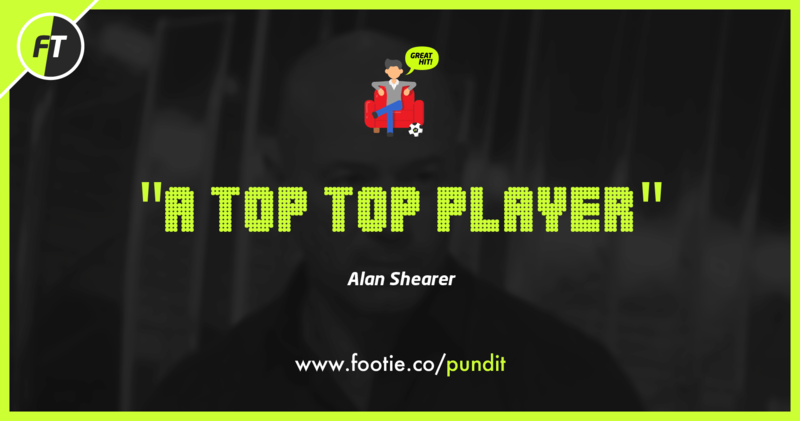 Mr Shearer knows a “Top Top Player” when he sees one. This is also used by Graeme Souness in the Sky Sports studio on a Sunday afternoon. One would say the Scottish hard man also knows what it takes to be a “Top Top Player”. Unlike the tough guys in the ‘other’ sport, rugby, proper ‘scraps’ in English football have been few and far between. We may have seen teammates Bowyer and Dyer slug it out on the halfway line in one Premier League game and Roy Keane take a swing at Alan Shearer with no real intent of making a connection. These generally are put in the “Handbags” category. The Vieiras and Savages of the Premier League era didn’t fight, they just caused mischief and had the odd tussle. While this seems to be a regular saying on the punditry circuit, the immaculate Jamie Redknapp – in his evaluation of players such as Theo Walcott – has dropped this beauty in from time to time. Best used to describe players who have an abundance of pace or those less fortunate to have lost “A Yard Of Pace” following injury or entering the veteran years as a player. Talk about stating the obvious! One of football’s most classic clichés, This comes in to play when there’s practically noting to commentate about, or a game – ‘on a wet Tuesday night in Stoke’ – is played like a game of chess. Martin Tyler is one commentator who likes to drop this in to a game to prompt a co-commentator to let the viewers they are still awake! 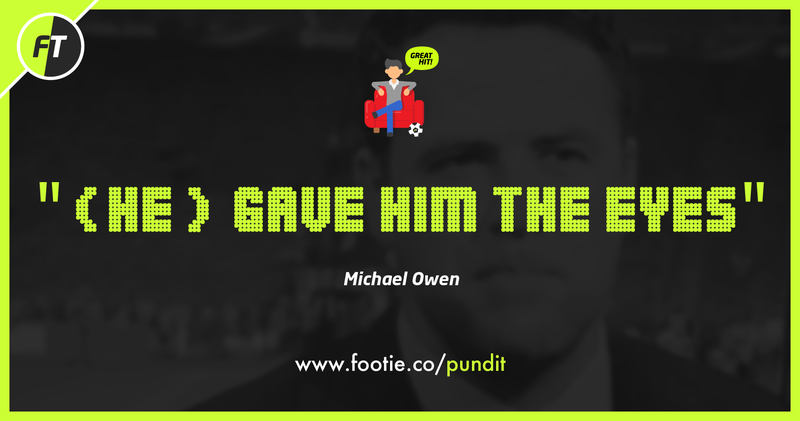 For all the ridicule and stick Michael Owen gets for his rigid commentary and opinion, “(He) Gave Him The Eyes” is something The former Liverpool hitman knows all about. Describing how an striker bearing down on goal, one on one with an onrushing keeper, giving the keeper the ‘eyes’ basically means you force them in to a decision allowing the striker to take full advantage. Of course, Michael Owen was the master at this. 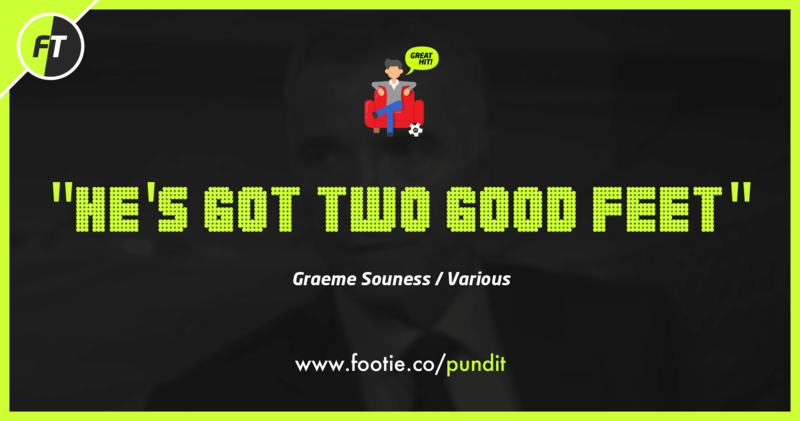 This is another Souness gem, but is widely used by other pundits. This is generally used when describing the Le Tissiers and the Lampards of the game. Much of their success was down to the fact the were strong with both feet. While this generally means to manoeuvre in a small or very tight space, I first heard this when ITV legend Brian Moore once described a quickfire Mark Hughes swivel in the late 80s – he also once described Hughes as ‘Leaping like a salmon’ (Like only Mark Hughes could) in one game too. In the mid-nineties, we had the luxury of comprehensive Champions League football exclusive to ITV (I can hear the music now!) 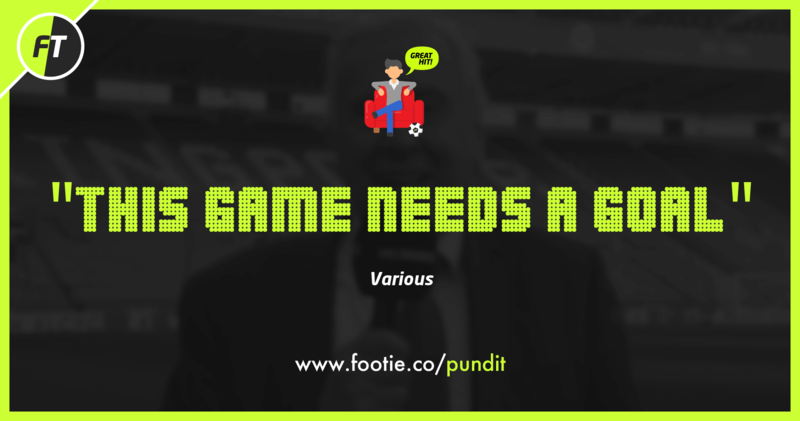 – and along side the late Brian Moore was none other than Ron Atkinson (who later was fired for his off the air antics) – During the season we got to learn about all these exciting players like Bokšić, Litmanen and Stoichkov. 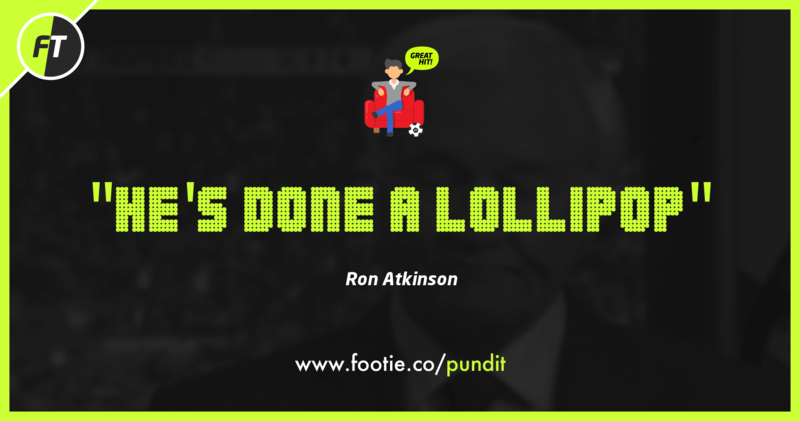 One game, I can’t remember – possibly describing a skillful winger from Porto – Ron Atkinson piped up with the phrase “He’s Done A Lollipop” – which has stuck with me ever since. In short a lollipop is cockney rhyme for a ‘trick’ – it all makes sense now! This is another Ron Atkinson classic I remember from those Champions League evenings. “In His Locker” basically describes a certain players attributes… Ryan Giggs had an abundance of pace “In His Locker” while the Brazil’s Ronaldo has strength, pace and tonnes of goals in his! Gary Neville certainly has a lot to say in his evaluation of a game. This one crept in recently when commentating. When the player in question opted to get his laces round the ball, GNev suggested he should have opted for a ‘dink’ over the keeper instead. In short – it’s a type of subtle finish.